Pietrasanta, in the province of Lucca and not far from Camaiore, is a wonderful city of art of Versilia, that thanks to its magnificent region characterized by sea, hills, mountains, culture and entertainment, is a renowned tourist resort, ideal for any kind of stay in all the seasons of the year. Made famous by the international community of artists, Pietrasanta has a rich and great artisan tradition, still alive in laboratories, companies specialized in the field of artistic mosaic and numerous art foundries. Among the artists who have contributed works and donations to urban furnishings, stands the Colombian painter and sculptor Fernando Botero, whose work "The Warrior" in Piazza Matteotti stands guard at the entrance to the village. 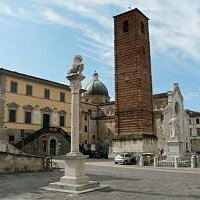 Other sculptures which adorn Pietrasanta are: “Memories of Pietrasanta” by Pietro Cascella, “The Bird” by Jean-Michel Folon and “The dream key” by Kan Yasuda. Renamed "Little Athens" for the excellent cultural and artistic heritage, Pietrasanta has a charming historical centre with its numerous magnificent monuments, among which we would like to mention: Saint Martin’s Dome or Saint Martin’s Collegiate, a splendid church in roman-gothic style built in the XIV century on a previously existing church, in which you can admire the remarkable works of sculpture and painting; Saint Augustine’s church and convent, built at the beginning of the XIV century and today houses the Municipal Library “Giosue Carducci” and the museum of sketches, the Civic tower or the Tower of hours, in gothic style, the Rocchetta Arrighina next to the arch of the door of Pisa, built by Castruccio Castracani in the fourteenth century and named after his son Henry; Moroni Palace, today houses the municipal historical archives and the Versilia Archeological Museum “Bruno Antonucci”; and the Little square of Centaur, a small square with white marble furnishings which hosts the bronze statue “The Centaur” by Igor Mitoraj.